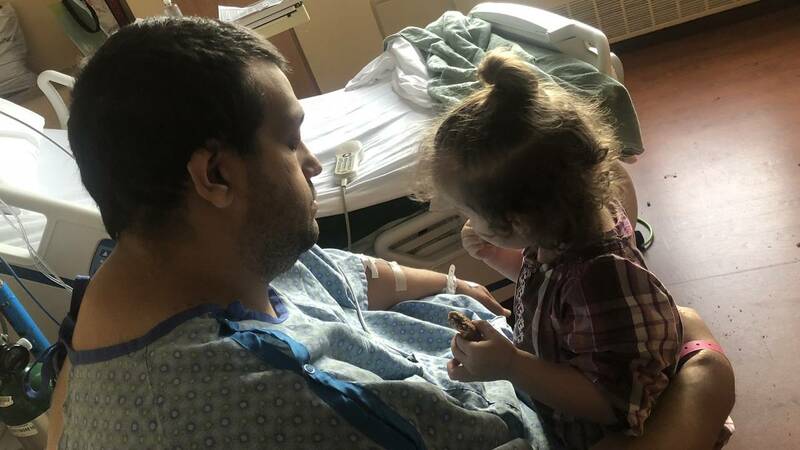 Anthony Barela, 30, holds his daughter Cataleya, now almost 2, during a hospitalization in January at Porter Adventist Hospital. (CNN) - When the hospital called, Dustin Cuzick thought it might just be routine paperwork, but he had also been hoping for good news: that a friend had been cleared to donate a kidney for him. "I was kind of waiting for the call from them saying, 'Hey, she's a match. Let's do this.' And now I know that's not gonna happen," said Cuzick, a 35-year-old reporter for Colorado Springs' KKTV 11 News, a CNN affiliate. The call, it turned out, was to let him know that the hospital where he hoped to get a new kidney and pancreas was temporarily shutting down its transplant program. This time, he found himself on the other side of a news story. Cuzick, who has end-stage kidney disease from Type 1 diabetes, is among the 232 patients of Porter Adventist Hospital in Denver who must find a new program if they want to remain eligible for a transplant while that program is inactive. And patients like Cuzick, who took upward of four months to get approval from Porter in the first place, don't know how long it will be before they're accepted by one of two other transplant programs in the area. "I feel like I put all my eggs in one basket," Cuzick said. The voluntary suspension of Porter's kidney, liver and pancreas transplants is expected to last six to 12 months, during which time the hospital says it will update its program and restaff vacancies that have accumulated over the past couple of years. Todd Folkenberg, CEO of Porter Adventist Hospital, said in a statement last week that "The decision to temporarily stop performing transplants was not taken lightly." Experts say that wait times for these organs can last years and that a months-long closure could be especially pressing for patients near the top of the list. Patients want to know why they had no advance notice. "If you feel like this was a hard decision, why weren't you trying to help us?" asked 30-year-old Anthony Barela, who found out about Porter's closure on July 4 when his mother texted him a news article. "It's a setback that I wasn't even close to being remotely ready for," Barela said. Barela, once a high school athlete, now lives "in constant pain" that affects his joints, he said. He was 15 when what he thought might be a broken toe turned out to be gout, caused by a buildup of uric acid. His kidneys, he said, were already operating at half their normal capacity. Now, his kidney function is less than 10%. "At 30 years old, I feel like I'm 50 some days, maybe even older," Barela said. "I can live with being in constant pain ... but there's at least something at the end of the rainbow: getting a kidney. "At the end of the day, the pain isn't what's going to kill you." Although blood vessels in his arm have been prepared for dialysis, Barela has been holding off, hoping that a transplant option would come through. But with Porter's closure, he doesn't know whether he can wait much longer. He has been on the waiting list for three years. Cuzick, on the other hand, hooks himself up to a home dialysis machine for nine hours every night. He was diagnosed with Type 1 diabetes when he was 9, and doctors started to catch his kidney disease about three years ago. Over the next year and a half, however, "it went downhill pretty quickly," he said. Now, an entire wall of his living room is dedicated to boxes of fluid for his dialysis machine. "I thank God that I have dialysis. It's keeping me alive, and that's awesome. But it's bleak," he said. Getting approved to join the transplant list at Porter took several months for both Cuzick and Barela. Cuzick recalled various steps in the process: a series of medical tests, meetings with counselors, paperwork and even financial advising. "It's almost like getting into a college," said Cuzick, who has been on the waiting list for a kidney and pancreas for about a year. "I've worked so hard to get into that program." Cuzick and Barela have had friends and family spend many additional months going through the process of finding out whether they're matches, too. One of Cuzick's friends was five months into the process of determining whether she was a candidate to donate a kidney. "They told her they're hoping they'll be able to transfer her results to a new program when I get in one and pick up where they left off, but there's no guarantees," he wrote in email Tuesday. Both men worry about starting that process over at a new center -- and that time is precious, Barela said. "We're here one day, gone the next," he said. "If they had any indication ... that this was coming, they should have told all of these hundreds of people," Cuzick said. "We apologize to our impacted transplant patients and are working to support them through this transition however we can. The staffing situation for our transplant team has been dynamic, and a few months ago we did not feel a pause on our procedures was needed. After losing a few key positions in this tight labor market, we made the decision to temporarily stop performing transplants. At that time, we promptly began notifying patients." In a statement last week, Dr. Elizabeth Pomfret, chief of UCHealth University of Colorado Hospital Transplant Center, said that UCHealth would be "able to care for these patients and ensure seamless care." UCHealth is now Cuzick's only option in the area that performs combined kidney-pancreas transplants, he said. He was told Friday, during an initial phone call with the hospital, that it is receiving multiple calls from Porter patients and that it could take three weeks to hear back and begin the approval process there. However, he reconnected on Monday with the scheduling department, which took down more information and told him to expect a call back in about a week. In an updated statement Monday, Pomfret said that UCHealth has a "process in place for these patients to receive information as quickly as possible." She said the hospital is now responding to patients within a business day of receiving their calls and "immediately" registering them and requesting their medical records. As of Monday, it had heard from more than 30 patients affected by Porter's closure, of which UCHealth had been unaware before the official announcement last week. "We are working closely with Porter Adventist Hospital to ensure a smooth transition for any patients who choose to transfer their care," said Pomfret, who is also a professor of surgery at the University of Colorado School of Medicine. The other transplant program in the area, Presbyterian/St.Luke's Medical Center, has seen "an influx of calls this past week," according to the hospital's vice president of transplant services, Alyssa Johnston. In a statement Wednesday, Johnston said that the hospital has received calls from "more than 50 kidney transplant patients and 15 liver transplant patients" over the past week and that it has added staff and clinic availability. "Our team is working quickly and diligently to assist these patients in finding a new transplant center home," she said. These types of closures happen "a few times a year," in which centers "inactivate" for over two weeks and their patients move to new programs, according to Roger Brown, director of the Organ Center at the United Network for Organ Sharing, which manages the nation's transplant system. "I wouldn't call it an aberration, but I wouldn't call it common, either," Brown said. An average of 20 people die every day waiting for a transplant, according to the organization. And the demand for transplantation has grown in recent years, with the number of transplants rising 20% nationwide between 2012 and 2016. There are far more people who need these organs than there are donors, according to national data. In the case of Porter Adventist Hospital, Forbes said, the transplant program is over 30 years old, and this is the first time it has been put on hold. "Those candidates on that waiting list then, while that program is inactive, are not eligible to receive any organ offers ... but those patients continue to accrue waiting time," Brown said. "They do not lose their place in line." A kidney patient's place in line depends heavily on how long they've been waiting, while a liver patient's place may depend more heavily on how sick they are, he added. Experts say the typical wait for a kidney can last years -- and every year a patient remains on dialysis, the life expectancy of their future transplanted kidney goes down, and their risk of death goes up. Along for their medical journeys are loved ones who feel the urgency and need for a transplant on a personal level. "We're high school sweethearts," said Carissa Barela, Anthony's wife. "We've been together for so long, so I've seen ... the overall decline in his health. I see his pain when he wakes up every day." Cuzick said it's important that people find out how to become an organ donor wherever they live. In some states, it just involves checking a box when you get your driver's license, he pointed out. "Having been on this side," Cuzick said, "it's literally your life."